Devi learns Adhiraj has given himself the wound, to repent for giving wound to Devi on Maasa’s orders. She gets shocked knowing about his step. She feels there is a Ram in Adhiraj too. She starts respecting him. She gets hopeful that her relation will have a future. She helps Adhiraj in his business deal with a foreign client, when he fails to talk in proper English. Maasa gets angry when Adhiraj starts depending on Devi. Urmi ties up Devi in the storeroom. Devi manages to get free from handcuffs. She meets Adhiraj. She cuffs their hands. She tells her that she is very adamant. Adhiraj was learning the etiquette to deal with foreign clients. When Devi interrupts him, he tells her that he doesn’t need her help now. She says he will get profit if he takes her along. His ego comes in between. Devi throws the keys away. Adhiraj gets angry and aims gun at her. He tries to scare her. She doesn’t listen to him. He shoots at the handcuffs. It doesn’t break. Devi tells him that she will now stay with him in the party, and no one can separate them. Devi fails Maasa and Urmi’s plans. 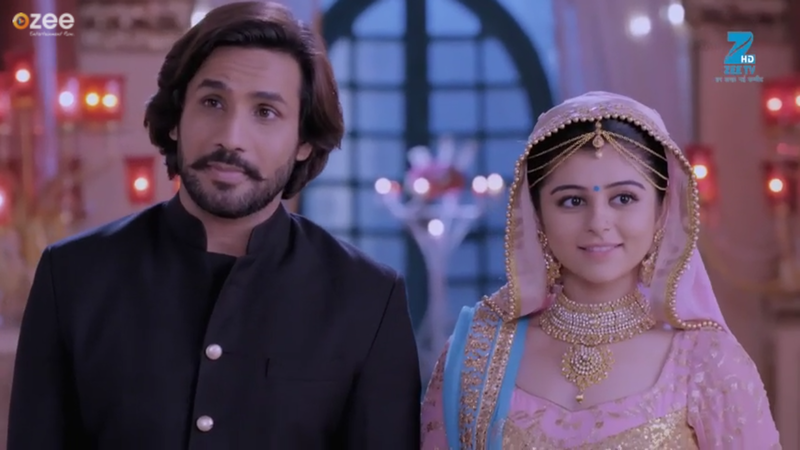 Devi tells Maasa that she is Adhiraj’s wife and she will be with him. She hides the handcuffs from everyone and just shows their love bond to everyone. Devi tries to find the manager and make him admit how he has worked on Maasa’s orders and tried proving her unlucky.